We provide young people in the UK with the opportunity to develop a relationship with the coastal and marine environment by funding trips to the coast and delivering outdoor sessions. We would like to create a movement so that the next generation can be inspired, be proactive in helping to manage our oceans and coastal areas, and encouraged to develop solutions for its issues. We recognise and reward students who are working on, or who have developed, an outstanding project in the marine environment field with the potential to have a positive and sustainable impact. This scheme is open to students at any level of higher education in the UK and has become a platform to further their research and studies. 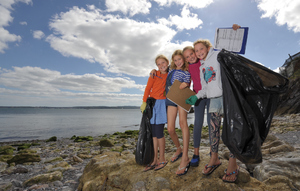 We aim to raise awareness of the threats to the marine environment in the UK and USA through our Roadshow which includes activities such as beach cleans, film screenings and art workshops. All of these projects are aimed at educating people about the threats to our oceans, highlighting the importance of personal responsibility and how they can help to shape the future of our oceans. Innovative and constructive partnerships play a key role in providing progress towards conservation and sustainability. If you are interested in partnering with us or would like to find out more about potential collaboration please email Sabrina Taseer, Projects and Development Manager at - sabrina@p1marinefoundation.com. We all need to make small adjustments to our daily life that can make a big difference to help improve the environment. •	Beach clean ups are the best way to be proactive and make a difference - join us for one of our beach clean events! Marine litter is one of the biggest threats to marine life and to nearby coastal communities. It damages wildlife mainly through entanglement and ingestion, and affects coastal communities by contamination and health hazards. We can help to reduce marine litter by minimising waste on the beach and educating others its negative impacts. The impact of boating on aquatic ecosystems is significant. The volume of hydrocarbons and oil pollution that enters the water around the coasts is estimated to be equivalent to an Exxon Valdez oil spill. We can reduce this effect on the environment by careful attention to routine boat maintenance and use.